Maitri Bagh is in Bhilai, India. Although claimed to be a mini-zoo, it is the largest in the region, spreading over 111 acres. It was established in the year 1972 and houses some great species like the tiger, lion, leopard, lion tailed monkey and rose pelicans. Maitri Bagh boasts of the country’s largest musical fountain and also offers boating and toy train rides for entertainment purposes. You can enjoy the different species of animals, the rides, and the musical show by relaxing on the lush green lawns. 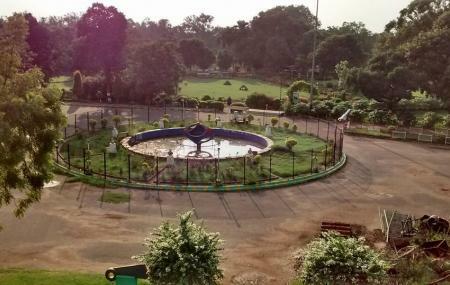 Use Bhilai trip planner to visit Maitri Bagh and many others to your visit. Fine Accommodation options like Hotel Ashish Inn, Starihotels Durg Bhillai, Oyo Rooms Near Power House and Hotel Kusum will meet your requirement of where to stay in Bhilai. Generate executable plans on your own or book the top rated Bhilai vacation packages for your visit. Read more on how to reach Bhilai. Love this? Explore the entire list of places to visit in Bhilai before you plan your trip. Fancy a good night's sleep after a tiring day? Check out where to stay in Bhilai and book an accommodation of your choice. Beautiful quite place, explore the beauty of nature with animals. Parking price ( 20 rs) is more than zoo ticket price (15rs) that's the matter of laugh, not too much. Compatible picnic place, Good to visit in February because flowers show in this month make this zoo more beautiful, specially in rosy weather. Healthy environment, love to visit here with friends and family. the biggest zoo in the region. The zoo comprises 111 acres of park lands. It is run by the Public Sector Undertaking, Steel Authority of India Limited. 2 shows are organized here in the evenings, on alternate days. White tigers are the main attraction of the zoo. Every year a flower show is organized here. Nice place for picnic.. variety of animals to see.. my kid enjoys this place. Toy train is also fun. Boating is also there. But cleanliness is not there as required. The biggest park in the area, and quite nice to be here but there are some problems that need to be fixed : area where white tiger are kept is a not and dirty or you can can say unclean there are weird smells all around, and the most important thing is that we "public" should not throw waste there, everyone need to understand that it is not park where you go have a picnic and came, it's a zoo where live animals so it should be maintained properly....... So make sure you don't throw waste there okay! One of the best place for make picnic with family and kids in Bhilai. Toy train is very attractive for children. Zoo is also cool place. You can't make food inside area. So when visits carry home made food or snakes from outside general store.